I woke up this morning and after checking my email and doing a bit of correspondence, I headed outside to begin harvesting berries, branches, and boughs from my yard. Thanksgiving is NEXT WEEK and we are starting to get our greenhouse design studio fired up. 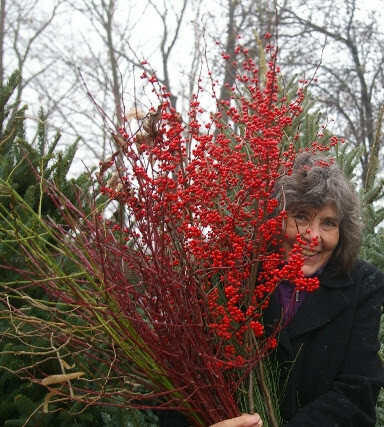 I picked orange winterberries, glowing ‘Flame’ willow stems, red twig dogwood branches, red winterberries, andromeda flower buds, and a bunch of golden arborvitae boughs. I stuffed my car full for the first of many deliveries of locally harvested materials for our arrangements, all-natural cemetery pots, wreaths, and swags. I have been planting in my yard for over 12 years now and the work has paid off. 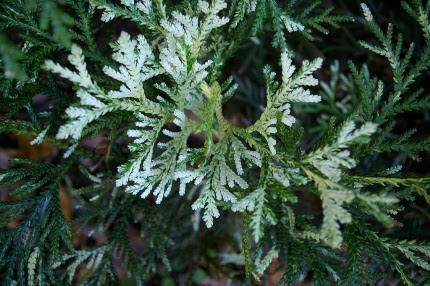 I have evergreens of every color and texture, many quite unusual such as the variegated Thujopsis shown on the left. Despite the drought, my berry branches are lush and full. We start with orange winterberries (Ilex verticillata ‘Winter Gold’) at Thanksgiving, combining them with mini-gourds and pumpkins, succulents, dried flowers, fresh flowers, and greenery. Right after Thanksgiving, we switch to a palette of red, green, and burgundy. I love picking fresh material. It really makes a huge difference in the designs that we create. We welcome custom orders. If you have ordered from us before, we have your records in our computer. We know the size of your wreaths, the length of your roping, and all the details that will make your decorating so much easier. Need a gigantic swag for the front porch? Not a problem. We can do that. 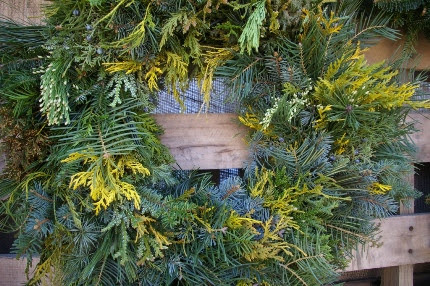 Looking for a handmade, mixed wreath with blue and gold evergreen accents. I’ll pick the greens and make it for you. We want Natureworks to be your happy place. The place where you come during the holiday season to unwind, inhale the intoxicating scent of fresh cut live greens, and soak up the natural beauty that so inspires us. Thanksgiving Tablescaping the Natureworks Way! Open House Weekend is Here!